Small / Medium - $19.99 Medium / Large - $19.99 Only 5 left! You know what look we think is making a comeback? Goth! We mean, if handlebar mustaches are being worn (unironically) and side ponytails are kind of a thing again, we say: bring back the black and give us more goth! It’s time. 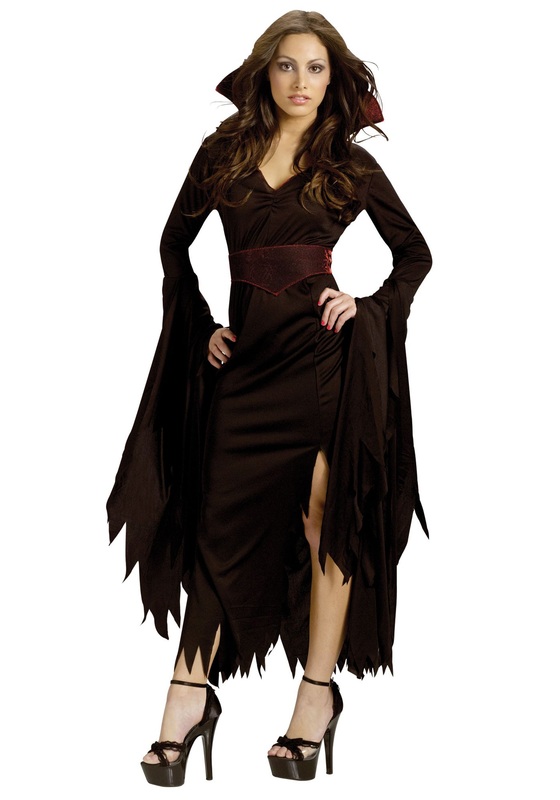 Get one step ahead of the sure-to-be trend and take this Women's Gothic Vamp Costume out on the town. With this outfit by your side, you can easily create a classic look for Halloween without a lot of bother, and we all know looking like you don’t care is a huge part of the goth aesthetic. This ensemble mixes the ghoulish darkness you adore with a hint of luxe glam--turning you into the vampire vixen of your dreams. We think you’ll show up on a few street style blogs before the night runs its course. The V-neck dress features a standout stand-up collar, while the skirt and sleeves feature a jagged hem that whisper of wild adventures by moonlight. Wear this goth look by itself, or add dramatic accessories such as sassy shoes or boots, a dark velvet cape, a skull purse, smoky makeup, or even faux fangs. This dress is perfect for toasting a night out on the town in your own signature style or for a cozy night in a Transylvanian castle! Get ready to say you brought back goth before it was cool again. Very nice costume with a flattering cut!